But what can it do that an iPhone can’t (or couldn’t without a bit more software)? Seems like it would be wedged between the iPhone and MacBook. But the MacBook can do so much more for a comparable price and the iPhone does almost as much. I think the iPhone itself could end up being this device if you add a BT keyboard and open up 3rd party development. Very nice, and quite plausible. 🙂 One thing to note is that I don’t think it would ever have “Touch” in the name. The “iPod Touch” is only named so in order to differentiate it from the “iPod Classic”, in the same way that there was once an “iPod Video” which later simply became the “iPod” when they phased out the non-video model. Since there is no previous table product to differentiate from, Apple would surely go for the simplest name possible. What would be amazing is if the device had a camera which projected an input device onto a surface. A bit like your keyboard picture above. So u put the device vertical and then a camera like an inbuilt isight projects an input device onto the desk. In theory it could project anything. A massive touchpad, a chessboard, an abacus, calculator etc. etc. and it uses some amazing technology to recognize where ure hands are. Great stuff, Chris! A stand to hold it as a fixed display with a built-in charger, plus extra USB/Firewire ports would be excellent. I’d love to see a software package from Apple, too, that would be good for sketching/design thrown on there for good measure. A combination Illustrator/Visio/Sketchpad app. 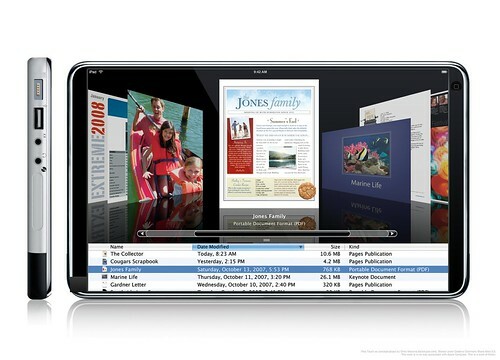 Pingback: Incremental Blogger » Blog Archive » What an Apple Tablet might look like. What would cause me to switch to a Mac would be if the space where the touchpad currently is became an empty hole where I could snap in my iPhone or iTouch. I’d use it as a touchpad on the Mac, fling stuff back and forth from one to the other, and then take it with me when I was done. And if you want a larger tablet, there are plenty to choose from, including the one I carry daily — a Thinkpad X60 tablet, which is 3 pounds (no optical drive) and has over 5 hours of battery life. I just don’t see why it’s necessary to pine for Apple in this field when there are plenty of good competitors already. You seem to have forgoten quite an important peace of technology on this device: built-in iSight camera. I really like your renderings. Your idea of the iPad Touch being a bigger iPhone/iPod Touch is interesting. A $700-800 price point is extremely unrealistic. It would probably parity the Windows Tablet PC prices, just be a better value. However, I don’t think its likely that Apple would expect people to dole out $1500-2000 for a tablet PC with a stripped down iPhone Leopard OS X. It would make more sense that it would operate a full blown Leopard install with an add-on touch package to allow for multi-touch and supporting utilities. I agree that it would be only one spindle (no optical drive) and it would be nice to support SSD flash based HDD, albeit an expensive option. It makes sense that this ultra portable product would be the first to incorporate new power saving technology and supports the idea that it would have a Macbook Pro class price point. They would probably approach Foxconn for the production like their other laptops. The screen will likely use the 13.3″ panels and Santa Rosa chipset from Macbooks to leverage their supply chain. Probably using the ULV versions of the Core 2 Duo. I picture Apple providing a dock/cradle that the Touch device could sit in to use with a keyboard. The next iMac could closely resemble this product. Perhaps an iMac Touch that could be angled and lowered act like a Wacom tablet for input. Would you be willing to do another example with the Leopard desktop overlaid on your iPad Touch rendering? Again, great job and nice speculation. For the love of all that is good and holy, please add punctuation to the touch keyboard, especially if there is room. Why tap 6 times in order to type an elipses (…)? 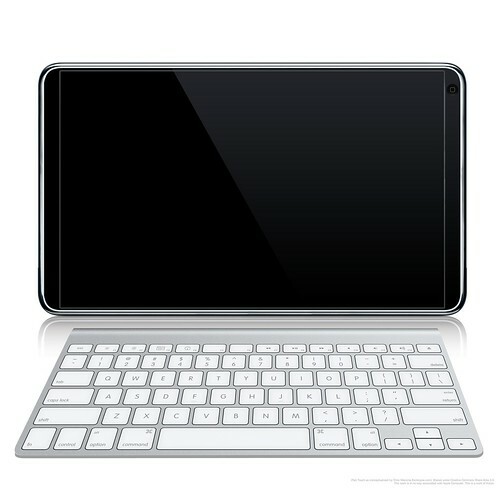 I like your concept however I see two distinct Tablets type computers in Apple’s future. 2) The second device is more like an UMPC and will run Leopard, use a stylus and take it’s design cues from the new iMac. I believe Apple will market it as a productivity/creativity device for Getting Things Done(TM) and freedom to create anywhere(whip it out, take a photo, sketch an idea over it, add voice annotation and email it to a client). Pingback: Geekninja » iTable ? 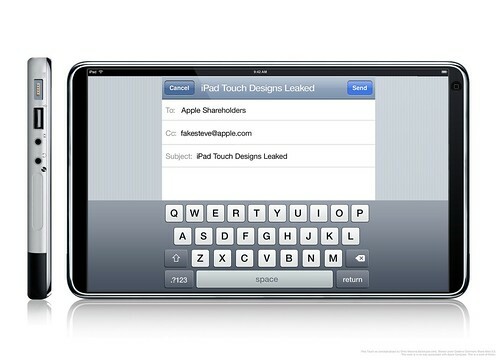 Pingback: T24 » Koncept: Apple iPad Touch alebo MacBook Touch? Excellent mock-up, just throw a flip-out stand on the back and it’s good to go. If I was Jony Ives I’d be knocking on your door right now. Pingback: Clipset » Blog Archive » Apple tablet iPad, ¿algo más que un rumor? This is gorgeous, in true Apple fashion! Pingback: Platform Peace » Apple Tablet PC? Yo, dis pooch is off the chain!!!!!!!!!!!!!!!!!!!!!!!!!!!!!! I am gonna be the first to get one!!!!!!!!!!!!!!!!!!!!!!! I am gonna get dis at mac world at the premiere! Yeah, I think it would work with a wireless keyboard. That’s cool. But how about the option to use a keyboard projected in front of you, as well? Every early adopter seen using THAT in a coffee shop will send a flood of new buyers to Apple. Everyone would want one. Gotta do the ‘Air’ thing. The unit’s gotta be superlight and superportable. No internal drives, all Flash storage. It’s a pad of paper, or Moleskine notepad, that you carry around easily, and it does everything you’d use the pad for, as well of course as everything an iPhone would do AND most things a laptop would do. I think you and I want the same product. But I really dig the projected keyboard part – that’s pure marketing gold. And marketing needs to be a key feature of this device – as any former Newton owner will agree. Funny, that’s what they said when the iPod came out. Didn’t realize Dan had already mentioned this. Gotta give props. Also, the device has to be able to stand upright if a projected display is going to work. So some sort of stable and durable stand has to pop out of the back somehow. Ideally it would stand horizontally OR vertically, though I’d settle for just horizontal. 1. Make a Keynote or PowerPoint presentation on your standard Mac. 2. Save it to the Apple PDA. 3. Carry only the PDA with you IN YOUR POCKET and use it as you would use a MacBook or other Mac to give the presentation in the classroom, scientific meeting, etc. Even the MacBook Air is too large and heavy for us. We need something much smaller and lighter with a full Mac OS X inside to run truly NATIVE Keynote and PowerPoint files. We need thousands for our University and we will pay whatever price for it. Add these two additional functions and it’s game over for sony, amazon, msft, etc. Digital Ink: Not sure if possible but would be great to have digital ink as well as full LCD…you can’t beet the resolution (and battery life) for reading books. That’s all, two simple requests…and you’ve created the third definitive form factor. I envision something like the inexpensive netbook format popularized by companies like Asus and Everex. Asus is one of Apple’s contract manufacturers and I have no doubt it is the vendor tasked with building this device. Given some of Oppenheimer’s comments, I’m thinking the price is going to be the same as netbooks from HP but with dramatically better functionality…while I agree with your price points I believe Apple might go even lower to $499. Pingback: L’iPad Touch est une brillante tablette - Gizmodo - Tant d'amour pour ces fabuleux nouveaux gadgets, c'est surnaturel. I have seen this concept floating around the net for a while now. I love it. I would wait in line for however long it took to get one. I have been wanting a tablet PC for sometime now as my old Dell laptop is too heavy and just not convienent for me. I love my Iphone and stood in line for 3 hours for the 3G Iphone. Thanks for your great renderings. The full power of Leopard in your pocket. I didn’t see yours before I developed this concept so that being the case it seems fairly likely that we’re on the money (although iPad vs iPod could be confusing… I can’t come up with a better name… iNet… iNote… iTablet… iSlate… etc.). Directly install apps like you would on your Mac. Nicely Done! It exactly the same logic and image I would imagine, but rendered and explained much better than I ever could. I think your pricing is right on. I’m wondering whether or not the accessories world is planning on this, as it seem almost inevitable. I’m wondering if they’ll offer as many ports, or stick with primarily USB/firewire. If more hardware mean more weight, it’ll be a tricky balance to keep it sub-2lbs and still have a decent battery life (2+ hours). With USB flash drives available up to 32 GB, an optical drive is unlikely. You could store any number of books and movies on one of these, no problem. The software keyboard is the best solution for manual input. Bottom line, WANT! WANT! WANT! It must come with nothing less that an OLED screen! If not, I am not going the extra dollars. Why would we wait for Apple? To get the quality built into Apple hardware and software. All or the PCs I’ve owned, including an IBM laptop were a total POS next to my iMac. Even the keyboard is he best I’ve ever used. When it comes to software, Apple’s is far more reliable and robust than most. True, they need to keep a rein on 3rd-party products, which they do pretty well. Even so, so shoddy stuff slips in from time to time. Often something horrible ported over from the PC side. Even more often, a Microsoft application that never worked well on the PC, either. All the Apple tablet wish lists in all the blogs I’ve read so far hasn’t mentioned anything about heat issues. We all know that most of Apple’s consumer-line of computing products (macbook, macbook pro, imac white/aluminum) suffer from massive heat issues. I would like to see Apple come up with a heat dissipation method that doesn’t cause first-degree burns. bigwang What heat issues? I have an iMac and it runs far cooler than any PC I have ever had. The cooling is so efficient that I cannot hear the fan while my wife’s PC across the room can be heard two rooms away. Perhaps you are addressing a problem I have never seen on any Mac I have even owned? Scrummy yummy !!! I want one NOW !!!!!!!! p.s. Will it fry eggs too ?? The size is too big to handle it while mobile. Half size is prefer. there was a demographic of graphic professionals that have been behind macs getting a tablet because of an all in one wacom graphics computer but this probably doesn’t even skim the surface of what a wacom can do not to mention what a PC tablet can do. this just another gimmick people can check their facebook or write their 140 character or less tweet updates on. something they can fit in their line between their iphone and their lowest of the low macbook. I hope this bombs so Apple and shapes up. Exactly how should Apple “shape up”? Let’ see, Apple is one of the most successful companies in the world with some of the best ROI numbers anywhere. They have consistently released innovative products that are copied by competitors and the entire industry watches them to see which way to go next. Love them or hate them, you can’t deny the facts. well, obviously YOU can. but they are still facts. Hopefully it will have good printed and cursive handwriting recognition. With a stylus at the user’s option. Hopefully it will have a stand for comfortable writing. Hopefully the battery life will be so good you can use it for days on end and recharge it only when it crosses your mind. Hopefully it will be light enough to carry ‘everywhere’ without fatigue. Hopefully it will be usable in the outdoors (in sunlight). In other words, hopefully it will be decent enough to replace the Newton MessagePad some of us have been using for years since nothing to-date has the above features. Well, Chris, for a prediction two and a half years ago, pretty damn close down to the name and the prices. :-)! So far, the iPad is a big disappointment. Despite the slick presentation, I don’t see it doing anything that any decent tablet PC won’t do, including my 10 y/o WalkAbout HH3. Yes, the design is great and I’m sure the build quality is up to Apple’s usual standard. But I can buy a newer tablet on eBay for less than half the price and get the same functionality. The best thing about it is the SSD and those will soon be an industry standard. Sorry Steve, you missed the target this time. This is just a way to make people want it, so they can keep making money. i want an i pad so much i would do anything for one!!!!!!!!!!!!!!!!!!!!!!!!!!!!!!!!!!!!!!!!!!!!!!!!!!!!!!!!!!!!!!!!!!!!!!!!!!!!!!!!! I reallly luv this info because I want to get a iPad. I want to have an iPad sooooooooooo much that I would kiss the toilet to get one!!!!!!!!!!! So it’s a data organizer, IPhone and basic toys? It looks like a few things blended together- aka a really big IPhone. Hardly the ‘advancement’ I was expecting. I would buy a notebook over this any day. my god how close you were to the real thing. thats pretty good design right there. I think apple ripped u off. nice shot, chris. way to nail this one from waaaaaay out. almost spot on with the pricing, too. it sounds like a sanitary pad. i bet there were no women on the marketing team. I`m so wont it! Who can write plus and minus of Ipad??? Its a giant iphone..i so want 1 tho!! Must say that your concept is rather accurate. I do feel that the iPad could have more features, but I suppose that it would affect battery life. THe iPad will be a great technical toy for business people but the question is if normal people like you and me will buy this gadget? OMG!! Awesome!! I will have to save my babysitting money for 5 months!! Boy, you did got it way ahead, didn’t you. So impressive! Congratulations, very well done. WoW! james braselton, If English is not your first language, my apologies. But if it is, your post is a terrible comment on your education or at least, the lack of it. First, English uses capital letters frequently, like at the start of a sentence. So do many other languages, you should try it, they are used for a reason. Also like other languages, English uses punctuation marks to make the writing more understandable. Finally, there are spell checkers available for free for almost application or system you might be using, Windows, Apple, or Linux. Using one also helps the readability and credibility of your text. When it looks as though it was written by a poorly-educated eight year-old, many people tend to discount anything it might say. Having said all of that, if I do understand what you meant, I think we agree. The Apple iPad is a waste. A used tablet or netbook will do more, do it for less, and do it better. Compared to ebook readers though, the iPad is a marvel. I have a ten y/o tablet PC (Walkabout HH3) that exceeds the iPad and any ebook reader for my ebooks, movies, games, and web surfing. Furthermore, I am not tied to Apple, Amazon, or anyone else to purchase content. Most of my 800+ ebooks were downloaded for free and they are mine to share, transfer or delete as I choose. No DRM or any other user-restricting nonsense. I’ve been a Macintosh user and fan for over 20 years, but the Apple iPad has a big worm in it. I usually don’t post in Blogs but your blog forced me to, amazing work..beautiful ! 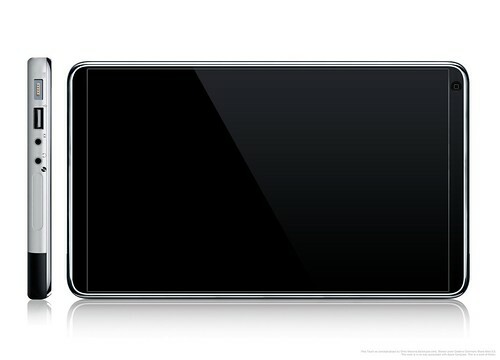 I like it but, I dont think the ipad is all that new.Its a oversized iphone,just cant call people from it i dont think.